This page will be updated as more information becomes available. For the most recent updates please go to the bottom of the page. The allotments here have been in existence since the end of the 19th century. With increasing population growth and industrialisation in Derby this is when the tape factory on Dean Street and the surrounding streets of terraced houses were built. Prior to this the allotment land formed part of the estate belonging to The Firs, a regency villa built in 1826. The Firs and its estate belonged to Rev Canon Edward Abney (1811-1892) who was the vicar of St Alkmunds church and came from a family of landed gentry based at Measham Hall. Towards the end of his life Abney sold most of the estate to a company of speculators and developers, the Derby Land Building and Investment Company which had been formed in 1877. This same company still owns the allotment land today, together with much of the property in the area. 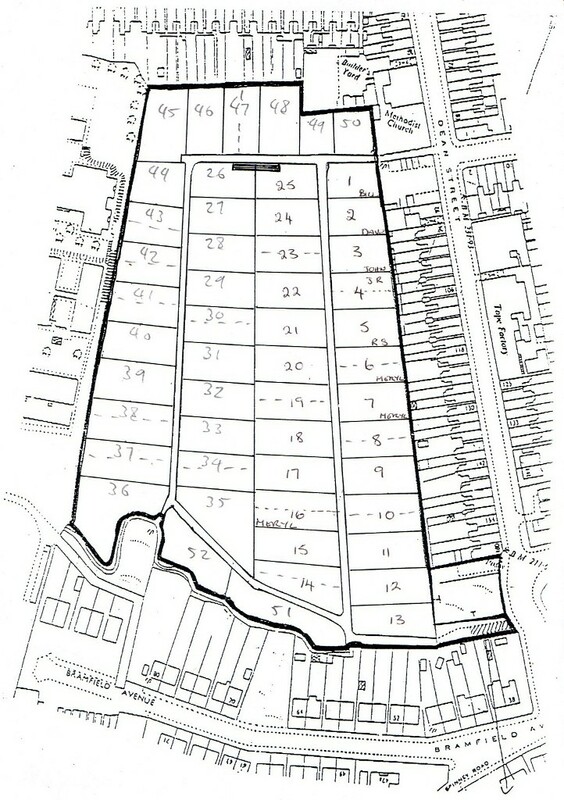 The 1947 OS map shows the surrounding area still further developed and also the individual plots on the allotment site. These are larger than today – as well as growing vegatables pigs and chickens would have been kept. 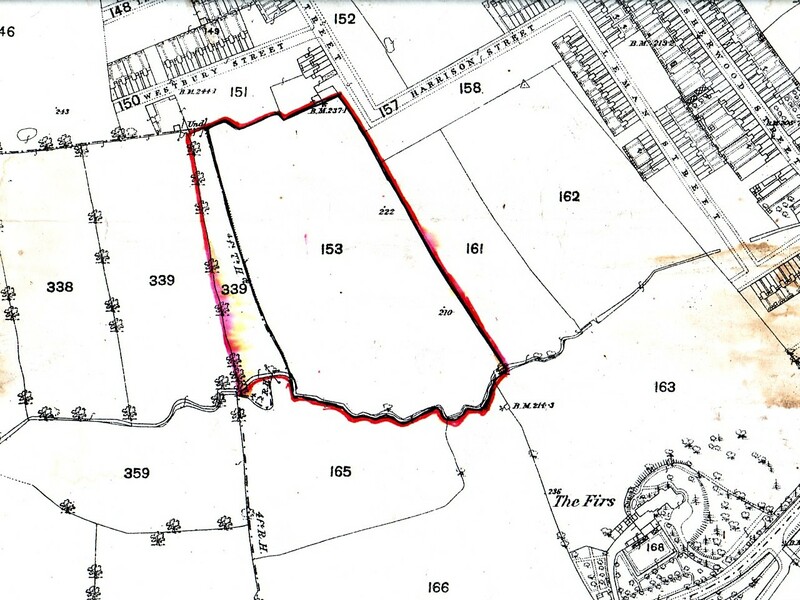 The area bordered in red was leased to the Borough of Derby and to what was then The Firs and District Allotments Association Ltd from the Stantons, another family of landowners, based at Snelston Hall near Ashbourne, who owned the Rykneld Estate. The area marked “Rykneld Allotment Gardens” was leased in 1923 and most of the remainder in agreements of 1937,1938 and 1940. Our site is the area marked “Gardens” in the right-hand corner. Most of this area has now been developed and the allotments lost, the only exceptions being our site and the area marked “Blue” at the lower right of the map which is now Bramfield Avenue Allotments belonging to the city council. The site now has 52 plots, 16 of which are divided into half plots. In 1972 the landowners applied for planning permission to develop the site for housing. Permission was refused but the owners appealed against the decision and a public enquiry was held in March 1974. The appeal was dismissed in a letter from the Secretary of State dated 18 July 1974. 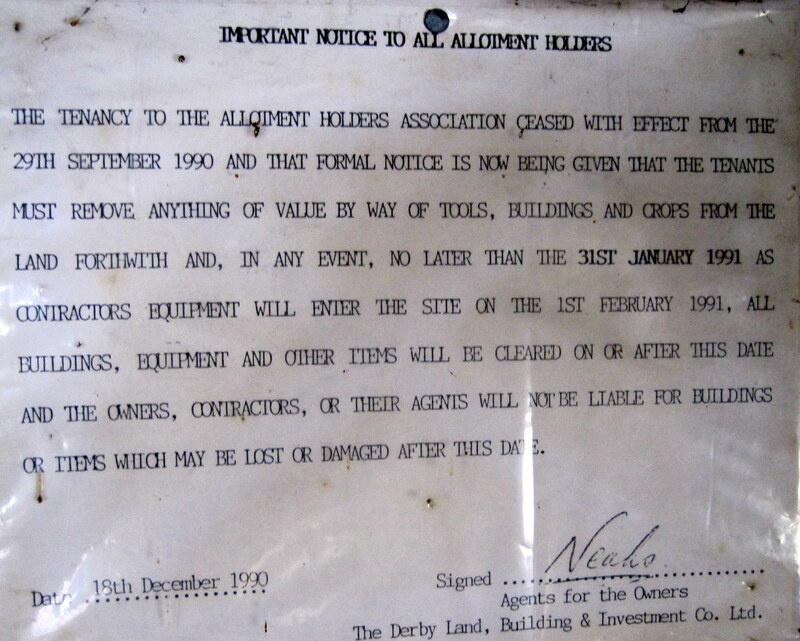 In 1978 management of the site became the responsibility of the newly-formed Firs Estate Allotment Holders Association and in 1984 a formal lease was signed for the next six years. The early 1990s would see the landowners make a more determined effort to develop the site for building. In October 1989 as the lease was coming to an end they again applied for outline planning permission for residential development of the site. In December 1989 the application was refused, this time on two grounds. One was a highway objection, the other was that the proposal would be contrary to the local plan because the area was designated as open space. In a blatantly cynical move the owners were evicting the tenants so that they could claim the land was vacant and so improve their chances of gaining planning permission. The matter would now be decided by a local public enquiry which was set for set for April 1991. The plotholders ignored the notice, changed the locks on the gate and occupied the site. They had the support of the local community, local councillors and green campaigners and on 9th January marched through the city centre to protest outside the offices of the company. On 31st January, on the night before contractors were due to move in, the plotholders began a round-the-clock vigil to blockade the site, setting up a caravan at the main gate. They let up when the company offered a temporary reprieve and gave a written pledge to council leader Nick Brown that the allotments would be left alone pending a meeting with the council. However on 18th February gardeners arrived at the site to find the owners had fixed padlocks to the gate, locking them out. “Many people on other sites said we didn’t have a chance against big money. But we weren’t going to walk away without a fight.” – Sandra Weightman, secretary of Firs Estate Allotment Holders Association. “This will be a clear signal to other developers in the city. It’s excellent news for open spaces and common sense.” – Sandra Heard, secretary of Derby Friends of Green Open Spaces. “I now hope the site owners will see sense and let the allotment holders return to carry on their legitimate business.” – Martin du Sautoy, chairman of the city council planning and development committee. In July 1991, having not received a reply from the owners to their offer to buy the land, the council approved a compulsory purchase order to acquire the site but the company put in an objection, forcing another hearing. In another twist in November 1991 the company offered plotholders new short term leases and also advertised the plots on the open market – at twice the previous rent. 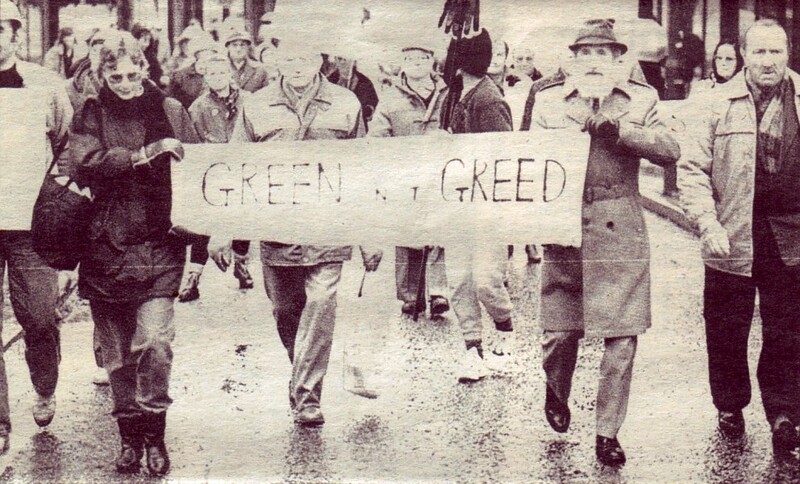 In February 1992 at the council hearing into the compulsory purchase order the owners suddenly reversed their position, matching the council’s offer of a 10 year lease to the allotment association which they had made should the compulsory purchase go ahead. The matter was then deferred whist the allotment association and the owners negotiated a deal with the help of the city council. In May 1993 the three year battle was finally over when the association signed a 10 year lease with the owners. We have recently entered negotiations to renew the lease for a further 10 years and have received verbal assurances from the owners agents that they will not be objecting to this going ahead. We now feel that the site is secure, even more so with the recent introduction of government guidelines to protect allotments sites and the strengthening of planning guidance in the local plan. Hopefully this turbulent period is now over although the battle to preserve the site left its mark. The uncertainty caused by the owners efforts to sell the site for development led to some gardeners giving up their plots or moving to other sites. Happily many stayed on and many more have joined them. Now ninety per cent of the plots are let. The campaign to keep this precious resource safe from the hands of the developers has brought us closer together as a community. New sheds and greenhouses are going up, derelict plots brought back into cultivation. We look forward to the future with a renewed sense of optimism. 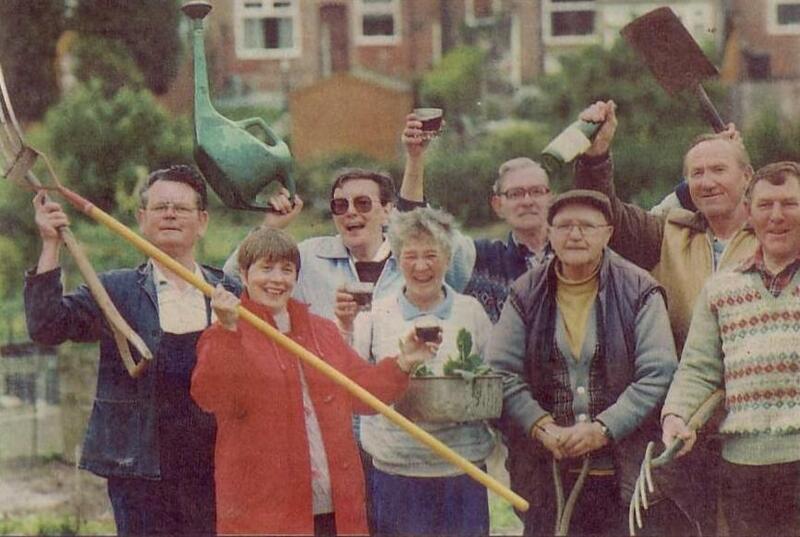 Allotments are an integral part of the heritage of working people. Long may they remain so! Update May 2008: The latest on the lease saga is that it still hasn’t been renewed although we are still paying rent to DTZ and the lease is being held over. We’re still here and we intend to stay! Update June 2010: Since this history was written about five years ago the association has gone from strength to strength. All our plots are let and well tended and we now have a waiting list. The owners have changed the agents who we deal with them through from DTZ to Austin Property Managment Services Ltd. We feel confident that the owners won’t try to develop the site again as with allotments now being so popular they must surely know the politicians wouldn’t grant them planning permission. Update January 2012: Our lease which started in 1993 and was originally for 10 years and then “held over” for a further 10 years is now up for renewal. We have brought this to the attention of both our landlords and their agents but so far have not received a response. With changes to the planning regulations in the pipeline it could be that they are waiting to see how they could use these to their advantage. I have been finding out more about our landlords Derby Land Building and Investment Company. An online search through companycheck.co.uk lists the company’s activities as “development and selling of real estate” and shows that the company is worth £1,554,139 as calculated from accounts filed in 2010. The company is also registered in Jersey, no doubt for tax reasons. I mention this only to show the type of organisation we would be up against should they again try to obtain planning permission to build on the site. In our favour is the new Localism Bill which in theory should give local people more say in what kind of development can be carried out in their area. How this will work in practice remains to be seen. Paul Elliott, who has researched the history of The Firs, says with regard to the estate that “Parts of it were sold off during the later nineteenth century after 1866. The last portions were sold to Henry Cox in 1879.” (Coincidentally 1866 is when Abney’s son William inherited the family’s estate at Measham). Parts of this information are contradictory or incomplete. 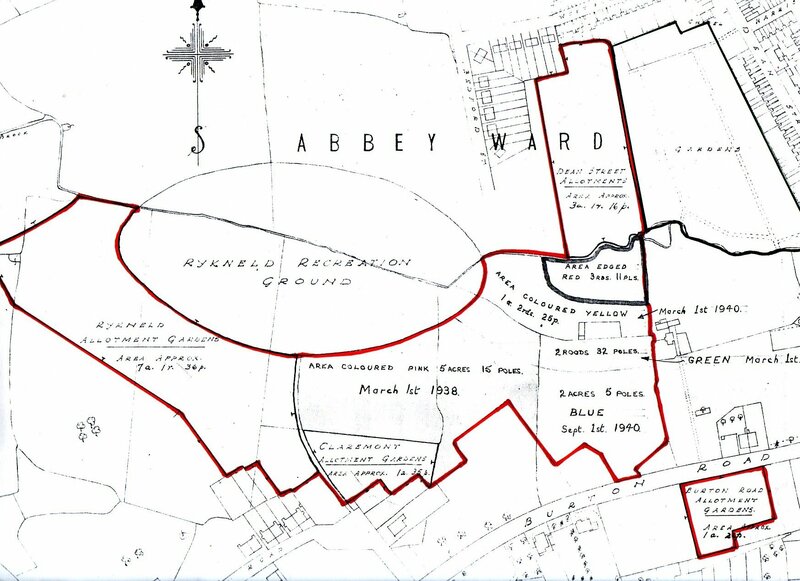 In summary it seems that most of the estate was bought by Derby Land from Edward Abney in 1878 but that the part which was later to become Rykneld rec was retained and sold to the council by his son Sir William Abney in 1913. However the allotment site still belongs to Derby Land rather than to the council so presumably it was part of the purchase or 1878. 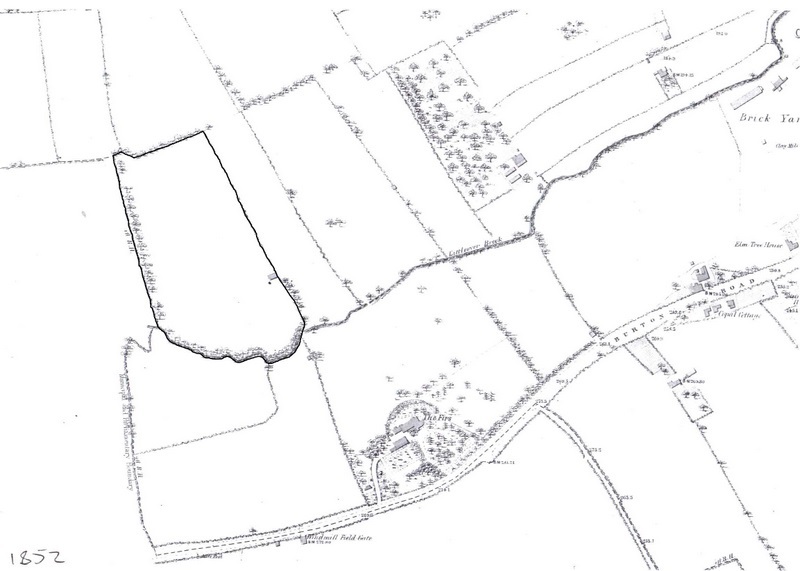 As seen above the 1883 OS map shows the site as still being a farm field. 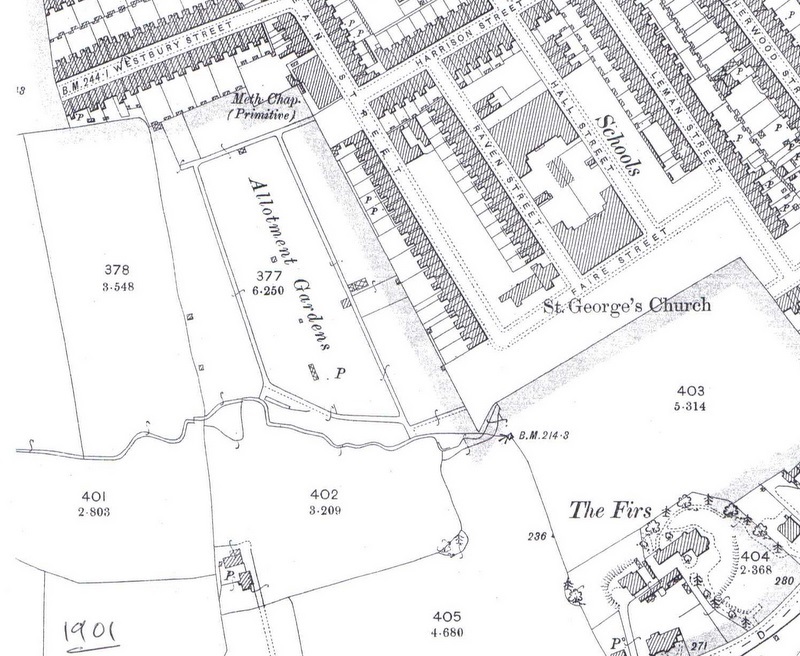 However the 1901 map does show the site, so it came into being some time between these dates. So why didn’t the company build on this land? It could have been that they had run out of capital, it could have been an altruistic move on their part, or it could have been that there was a covenant on the land or some other form of agreement preventing development. If this were to be the case then it would obviously have implications in any attempts by them to develop the land in the future. This may be wishful thinking but it remains a puzzle as to why a company whose business is buying land for development did not build on the site back then, as they tried to later in the 1970s and 90s.